Sea Kayaking is an exciting activity which perfectly combines exercise with pleasure. With this water sport, you can work out and, simultaneously, discover hidden corners of indescribable beauty, which would be difficult, if not impossible, to reach otherwise. Usually, sea kayak tourist trips cover beautiful coastal paths or short distances from island to island. Do not be discouraged if you do not have previous experience. A few-hour-pre-course, in which you will get familiar with the boat and its equipment and will learn basic rowing techniques, is enough. So, if you feel like exploring, love the sea and seek the beneficial contact with nature, then, sea kayaking promises a unique and extraordinary (for most of us) experience! Ideal destination for Sea Kayaking is Pelion. Great sightseeing, diving to remote beaches with gorgeous turquoise waters, natural water sources, and fairy sea caves are just some of the surprises which await you in this magical place! On the Centaurs’ mountain, there is the possibility of rowing in both sides of the Aegean Sea as well as on the side of Pagasitikos Gulf. One of the most popular boating routes is the route of Damoucharis-Fakistra (and back). Depending on your experience and your strengths, you can select intra-day or full day excursions. Seize the opportunity to visit the picturesque fishing village of Damoucharis, with its traditional stone houses and swim at the homonymous beach, with beautiful pebbles and massive rocks. And if you are lucky, during this wonderful ride, you may encounter playful dolphins and cute seals! Also ideal for Sea Kayaking is paradisiacal Halkidiki. In particular, you can indulge in water sports in the beautiful region of Vourvourou, which unfolds in the second leg of Halkidiki, full of pines Sithonia. This is an area of untold natural beauty, where the deep blue of the sea meets the dazzling green of the forest! The daily kayak tours offer an excellent opportunity to explore, inter alia, Diaporos; the largest of the nine islands of the bay; and swim at the well-hidden beaches of the peninsula, such as Myrsini, Galàzia Nerà (Blue Waters) and Kryftó. Excellent choice for Sea Kayaking is the atmospheric island of Santorini. The volcanic beaches and the spectacular rock formations, combined with the unique feeling of cruising in the quiet deep blue waters of the Aegean create an idyllic boating experience! Seize the opportunity to enjoy the famous Santorinian sunset, from a completely different perspective! In most cases, sea kayak excursions include picnics, snorkeling equipment and transportation from the hotel. A unique experience is Sea Kayaking along the Messinian coastline. Depending on your experience and your strengths, you can choose between intra-day and day tours. Sea routes in Mani are amongst the most popular routes of sea kayaking. Discover the wild beauty of the landscape, find out pristine shores and admire the historic, with the magnificent architecture of Mani, fishing villages of the area. 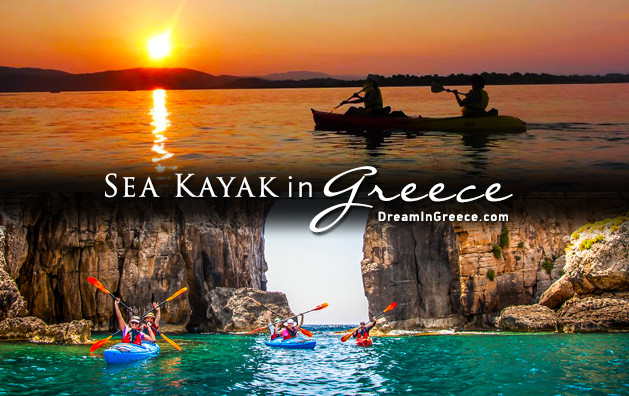 Alternatively, you can sea kayak in Navarino bay. The deep blue waters, the beautiful beaches and the medieval castles make sea kayaking an unforgettable adventure! You can also paddle in Kalamata and explore the seaside towns which unfold on the east. Countless bays with turquoise waters will surely fascinate you!